A combination of two topical creams already shown to clear precancerous lesions from sun-damaged skin also lowers the risk that patients will later develop squamous cell carcinoma of the skin, according to a new study. 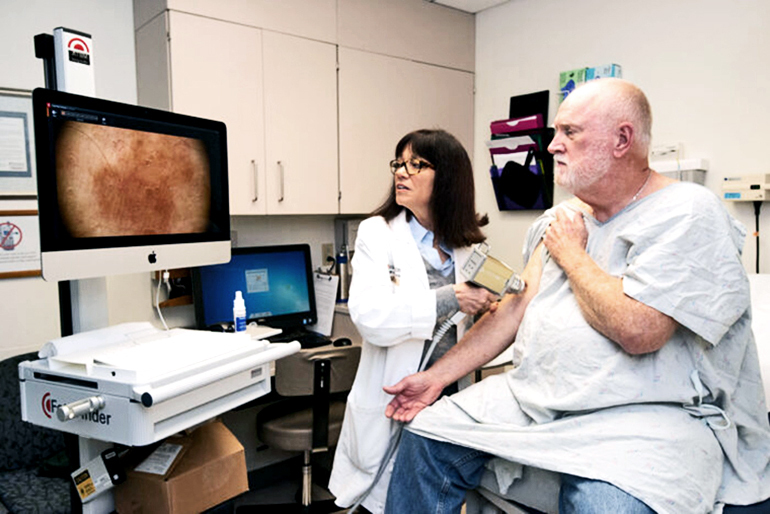 “Squamous cell carcinoma of the skin is the second most common cancer in the US, and its incidence is continuing to rise,” says study coauthor Lynn A. Cornelius, professor in and director of the dermatology division at Washington University in St. Louis. The therapy combines a cream formulation of a common chemotherapy drug called 5-fluorouracil with a synthetic form of vitamin D called calcipotriol. Standard therapy for the precancerous skin lesions—called actinic keratoses—is topical 5-fluorouracil alone. Calcipotriol is a standard therapy for psoriasis, an autoimmune disorder that causes red, scaly patches of skin. The same research team has shown that calcipotriol activates the immune system’s T cells, which then attack the tumor cells. In a past clinical trial they conducted at Siteman Cancer Center at Barnes-Jewish Hospital and Washington University School of Medicine, a combination of this immunotherapy plus chemotherapy cleared actinic keratoses better than standard chemotherapy alone. The investigators obtained follow-up data for more than half of the 132 patients in the original clinical trial for up to three years after initial treatment. The researchers found that patients who had received the combination therapy had a lower risk of developing squamous cell carcinoma on the skin of the face and scalp than patients who had received standard therapy. Of 30 patients who received the combination therapy, two (7 percent) developed skin squamous cell carcinoma within three years. Of 40 patients who received standard therapy, 11 (28 percent) developed skin squamous cell carcinoma in the same time frame. This difference was statistically significant. “This finding provides the first clinical proof-of-concept that an immunotherapy directed against premalignant tumors can prevent cancer,” says senior author Shawn Demehri of Massachusetts General Hospital and Harvard Medical School. The investigators found that the therapy reduced the development of skin squamous cell carcinoma on the scalp and face but not the arms. They speculated that the topical therapies may penetrate the skin of the face and scalp more than that of the arms and induce a stronger immune response in those areas. The researchers also note that this treatment regimen was relatively short—topical treatments twice daily for four days—and a longer regimen may be necessary to be effective on the skin of the arms and other parts of the body. Cornelius and Demehri are co-inventors on a filed patent for the use of calcipotriol plus 5-fluorouracil for the treatment of precancerous skin lesions. The Burroughs Wellcome Fund; the Sidney Kimmel Foundation; the Cancer Research Institute; and the National Institutes of Health funded the study. The study appears in JCI Insight. Additional researchers from Washington University School of Medicine in St. Louis, Massachusetts General Hospital, and Harvard Medical School contributed to the study.